Closing British airspace a mistake? 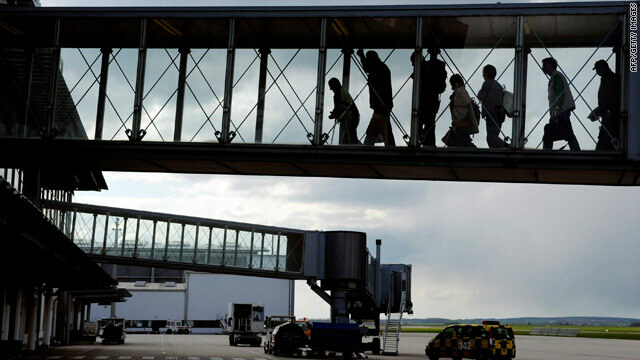 London, England (CNN) -- Flights across Europe are expected to return to "100 percent" on Thursday -- seven days after ash from an Icelandic volcano forced the shutdown of airspace and stranded thousands of passengers around the world, the air traffic agency Eurocontrol said. The mood among passengers was one of cautious optimism. After days of endless waiting, many reserved their celebrations for when they were airborne. "I think when we land down in America, then we'll know we're there. But at the minute, we're a bit cautious," said Georgina Evett. She was part of a group trying to fly from Manchester, England, to Florida for a world cheerleading championship this week. Manchester Airport was among many where flights are now taking off and landing. The closure of so much European airspace for nearly a week left untold numbers of travelers stranded, and it's not clear how long it will take to get everyone home. Many airlines added or rearranged flights to try to clear the backlog. The crisis set off a surge of emergency requests from stranded Americans, prompting the U.S. State Department to scramble to arrange everything from housing to, in one case, dialysis treatment for an elderly patient in Frankfurt, Germany. At its peak, the crisis affected 1.2 million passengers a day and 29 percent of all global aviation, according to the International Air Transport Association. It was the worst disruption of air traffic since the September 11 terrorist attacks in the United States in 2001. Following those attacks, the United States closed its air space for three days, forcing Europe to postpone all transatlantic flights. In addition to clearing a massive backlog of passengers and cargo, airlines now face financial headaches as well as logistical ones. Budget carrier Ryanair indicated Wednesday it does not plan to pay compensation to passengers other than lost ticket costs. The European Union's top official for transport had said Monday that airlines were responsible for taking care of them while they were stranded. The International Air Transport Association estimated Wednesday that the Icelandic volcano crisis cost airlines more than $1.7 billion in lost revenue through Tuesday. Between Saturday and Monday, when disruptions were greatest, IATA said lost revenues reached $400 million each day. The crisis began after the volcano beneath the Eyjafjallajokull glacier erupted Wednesday and sent a cloud of ash into the atmosphere. By the next day that cloud had reached Europe, where authorities quickly closed the airspace over safety fears. Airspace was being closed based on theoretical models, not on facts. Test flights by our members showed that the models were wrong. Volcanic ash can shut down engines and electrical systems and damage a plane's windscreen. By Tuesday, however, airlines had started to complain that the measures were too restrictive. Ash levels in most parts of Europe, they said, were low enough to allow the safe operation of flights. Scientists in Iceland said Wednesday the volcano has decreased its ash output by 80 percent compared to the first day of eruption, April 14. Armann Hoskuldsson, a volcanologist at the University of Iceland, told a briefing that the volcano's output is now "insignificant," though it will continue to be active for a while. That reduction in volcanic activity appeared to be the main reason that flights resumed operating in Europe on Wednesday, along with European countries relaxing their restrictions on flight, according to a spokeswoman for Eurocontrol, an intergovernmental body that manages European air travel. In Britain, the Civil Aviation Authority (CAA) issued revised guidance on flying through volcano ash clouds, allowing airlines to conduct their own risk assessments and requiring them to report any ash damage to the authorities. The 27 countries of the European Union also agreed with Eurocontrol to split the airspace into zones based on their ash content and to allow flights in the unaffected areas, said Spanish Minister of Public Works Jose Blanco. "Airspace was being closed based on theoretical models, not on facts," said Giovanni Bisignani, director general and CEO of IATA. "Test flights by our members showed that the models were wrong." He said the EU's decision to categorize airspace based on risk was a "step in the right direction," but Europe still needs uniform rules on air travel to avoid a repeat of the chaos of the past week. NATS, the air traffic authority in Britain, said it is confident it had made the right decision in restricting flights. "The primary concern for all the people involved -- the regulator, the government, and NATS -- has been to ensure flight safety," NATS Senior Manager Alex Bristol told CNN. "Until such time as we had evidence to give us different assurances, then the regulations which existed, and which we were using eight days ago ... then we had to restrict the airspace, and we did the right things." The current travel chaos is not the first time an Icelandic volcano has impacted the world, explains a scientist. Here are some common questions and answers about the ash cloud crisis. Was air shutdown really necessary? Aviation safety officials in Europe defend the closure of parts of the continent's airspace for six days. However you pronounce it, Eyjafjallajokull is proving difficult for the world's English speakers.